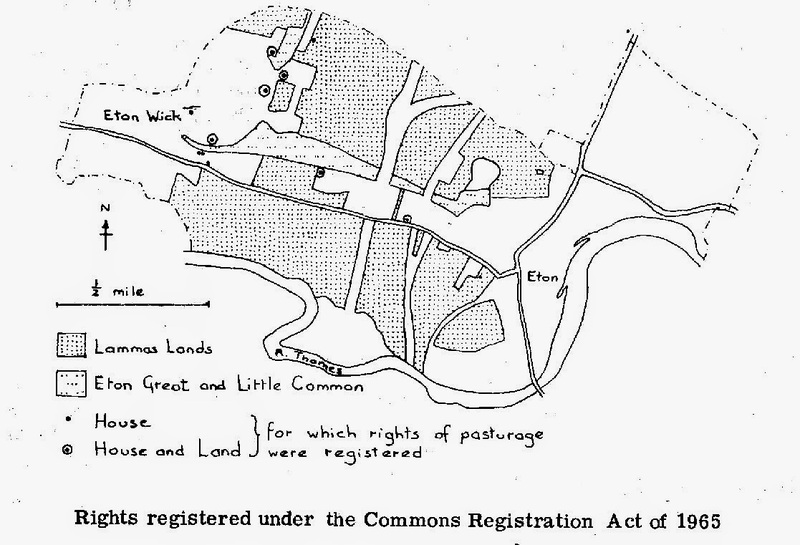 Eton Wick History: What evidence is there of Eton Wick from before written records. What evidence is there of Eton Wick from before written records. Besides the name, what else has survived from those early times of ten, eleven or even twelve centuries ago? Unfortunately there have been no archaeological finds* as at Old Windsor and Taplow to suggest where the Wick may have been, though probably it lay to the north of the brook in the area of Bell and Saddocks farm, for here the land is slightly higher and in times of flood has often remained dry. It was almost certainly near to one of the small streams that crossed the area and although most have dried up now, their courses can still be traced, at least in parts. The parish Lammas lands, however, are a legacy from the Saxons which in this century are a rare survival. Lammas, itself, was their thanksgiving festival for the first fruits of the harvest and was Lammas Day to lay claim to the lammas rights. Towards the end of the 1970’s there were many men living in Eton Wick who could remember as boys going lammasing' in the summer holidays, assisting the hayward when the cattle were taken each day to the fields, returning to be milked each evening. Today there is no longer a hayward; each farmer looks after his own cattle, but the lammas lands and the two commons were registered under the Commons Registration Act of 1965. This should mean that only by another Act of Parliament can this land be released for building. *In the early 1990’s there was an investigation into the crop patterns visible in aerial photographs of the Eton Wick causewayed enclosure. The PastScape website article can be read here.